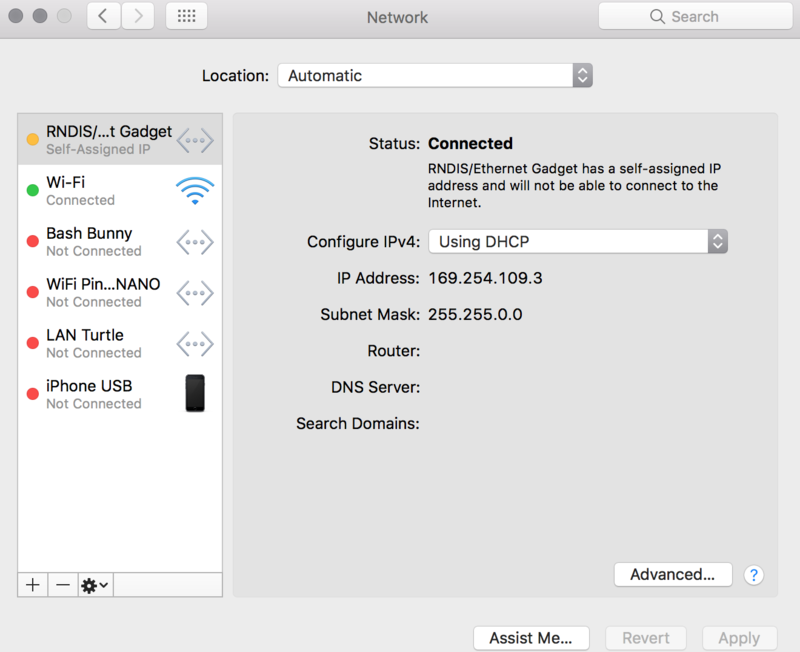 MacOS is not finding/discovering my Raspberry Pi Zero as an USB Ethernet Device upon USB connection. I flashed my Raspberry Pi Zero with the ARMEL firmware, linked on the page re4son-kernel. After flashing the firmware, I opened the /boot/ partition, I modified cmdline.txt and, because config.txt was not created I created config.txt. Inside cmdline.txt I added: modules-load=dwc2,g_ether after rootwait. Inside config.txt I added: dtoverlay=dwc2 to the bottom of the file. I also, added a file w/o an extension called: ssh to enable SSH on the device. I plugged the Micro-USB male header into the port on the Pi0 that gives DATA + PWR and then connected the male USB 2.0 header into the USB port on my Mac. After waiting a few minutes, I didn't see the Pi come up as a USB Ethernet Device. Please Note: I followed the tutorial, Simple guide for setting up OTG modes on the Raspberry Pi Zero, the fast way! by gbaman, however, instead of flashing Raspbian Jessie onto my Micro-SD card I flashed re4son-kali-linux. Why doesn't my Mac discover my Pi0? Is there specific settings I missed? Okay so after a bit of research, I figured out what the problem was with a little help from Re4son. What OS am I running? I am running MacOS Sierra on my MacBook Pro. – Add avahi to /boot/avahi Notice, no extension. This file is required to enable the ability to ssh to kali-pi.local. Install the HoRNDIS driver if not running MacOS Sierra MacOS Sierra already has the RNDIS driver installed. This installs the RNDIS driver for your Mac. If you already have the driver installed, deleted it and reinstall it. For some reason, the interface I had wasn't working for me and the solution was to reinstall the driver; see forum thread for more information. Run ifconfig usb0 to see if the Pi0 has obtained a valid IPv4 address. If the Pi0 did not obtain a valid IPv4 address then run: ifdown usb0 && ifup usb0. Check for an internet connection by running: ping 8.8.8.8. 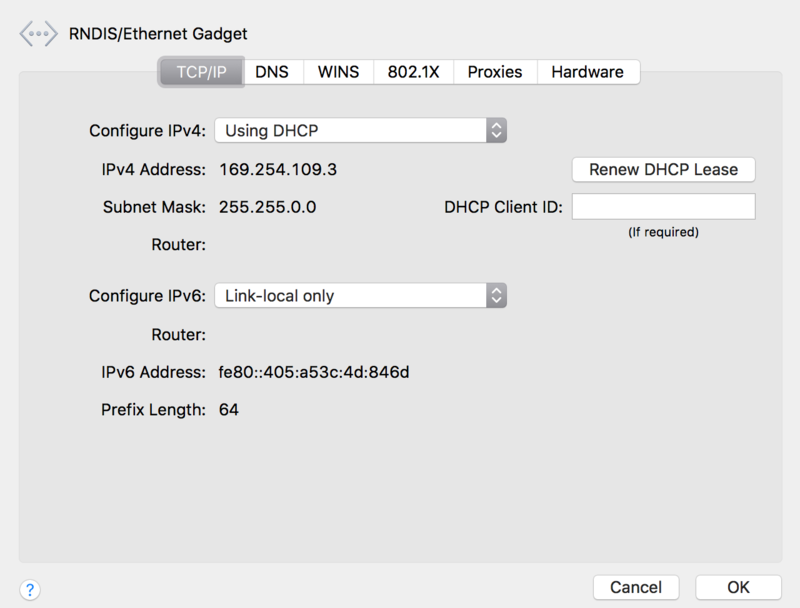 First, you need to have an RNDIS/Ethernet Gadget interface in the Mac's Network Preferences. This is available as standard on Sierra. However, it might not appear automatically in the Network Preferences, and you may have to add it, using the + icon. The list of available interfaces to add will not include RNDIS/Ethernet Gadget unless the Pi Zero is actually attached. RNDIS/Ethernet Gadget has a self-assigned IP address and will not be able to connect to the Internet. You should now be able to reach it at raspberry.local, e.g. with ssh pi@raspberrypi.local. The next step is to give the Pi Internet access; you can do this in Sharing Preferences, and share the Internet connection to the newly-established interface. Does the re4son kernel include the dwc2 and g_ether modules? 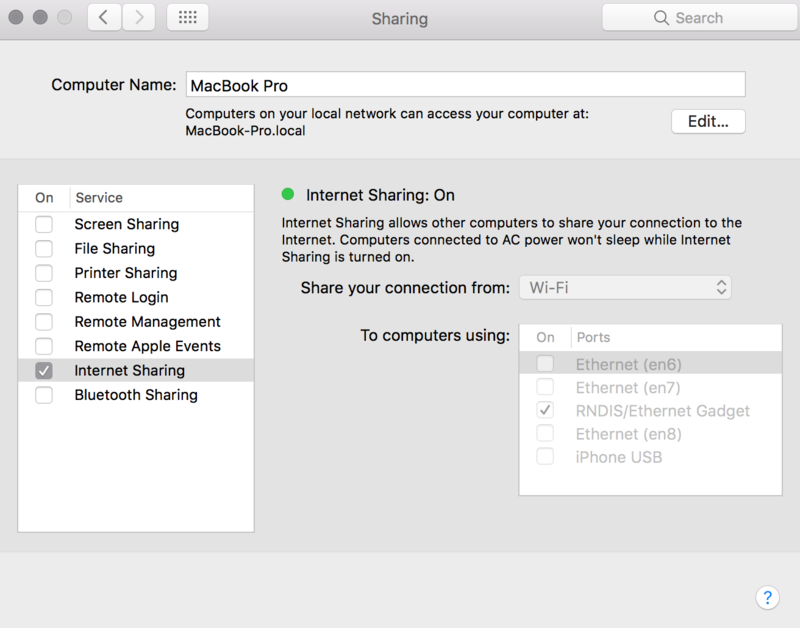 On your Mac, you need to enable network sharing under the System Preferences / Sharing option. You should then be able to see hostname.local (if your distro supports avahi) or a useful IP address for the local/remote side with ifconfig. Not the answer you're looking for? Browse other questions tagged boot ssh pi-zero kali or ask your own question. Should Raspberry Pi Zero in USB ethernet mode respond to DHCPDISCOVER request?